Add That Personal Touch With Affordable, Customizable Wedding Themed Treats, Perfect for Engagement Parties, Bridal Showers, and the BIG event itself! Middeltown, NJ-Weddings are a time for love, joy, and celebration. 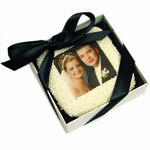 Make this event even more personal with customizable treats from http://www.ediblegiftsplus.com. Surprise the happy couple with a giant wedding fortune cookie complete with photo of their first date and personalized good fortune message or show your bridal party how much they mean to you by sending edible cookie bridesmaid and groomsmen invitations personalized with your very own message. Adding that personal touch is easy and affordable at Edible Gifts Plus. March 24, 2009. 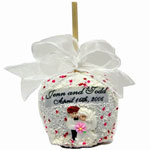 Tags: customized wedding favors, customized wedding themed treats, photo wedding cake, wedding favors. Uncategorized. Leave a comment. March 24, 2009. Tags: customized wedding favors, personalized wedding favors, photo wedding cake, wedding favors. Uncategorized. Leave a comment.